CNN's "iRevolution: Online Warriors of the Arab Spring," premieres Sunday, June 19, 8 p.m. ET & PT. It will re-air Saturday, June 25, at 8 p.m. and 11p.m. (CNN) -- Political revolutions in Egypt and Tunisia not only inspired other regional uprisings -- they sparked a flurry of ideas about how to help revolutionaries better communicate when their governments pull the plug on the World Wide Web. Shervin Pishevar, founder of Social Gaming Network (SGN), has a plan to give freedom-seeking individuals the ability to link up and form their own life raft to "make what no government can ever block." "I want to use technology to bring freedom to the Mideast," says Pishevar, one of 10 members of Ted Turner's U.N. Foundation's Global Entrepreneurs Council. And Pishevar's latest project, OpenMesh, would do just that. OpenMesh, which is nonprofit, involves the use of ad hoc wireless mesh network technology that mimics the survival instincts of fire ants: A single fire ant will drown in a pool of water. But if they link together, the ants can form a living raft and survive. Routers and mesh network-enabled laptops can link together to form a network enabling individuals to send messages along these linked "nodes" to create a local system that allows individuals within a group to communicate. If one individual within the mesh network is able to connect to the outside world, that person can share the connection with others on the network. Mesh network technology is not new, nor is it the only work-around to disabled wireless and Internet communications. But Pishevar and fellow tech entrepreneur Gary Jay Brooks are providing a space where online activists in the world's hot spots can come together to share their ideas. Starting in January, a regime-changing wave of protests started in Egypt, inspired by demonstrators in neighboring Tunisia who ousted their president in a popular uprising. The Egyptian government shut down the Internet for five days during the protests, so Egyptians used satellite connections, dial-up modems and land lines to call Internet service providers in other countries to get online. Mesh technology would have enabled those connected to share their connections along the network. By enabling groups of individuals with the physical hardware to work around any state-imposed firewall, Pishevar plans to give freedom-seeking people the tools to "eradicate dictatorships throughout the planet." Many hard-line governments will attempt to drown out dissent by controlling the Internet with kill switches and firewalls. But with a phone -- or a $90 router the size of one -- an individual can link to thousands of others, creating a private network harnessing the firepower of the Internet. And that can create a free community unbound by topographical and state barriers. The crackdown on the Internet in North Africa and the Middle East is hardly a new tactic to quell political dissent. A recent Freedom House study found that about a third -- 12 out of 37 -- of the countries reviewed had "consistently or temporarily imposed total bans on YouTube, Facebook, Twitter or equivalent services." 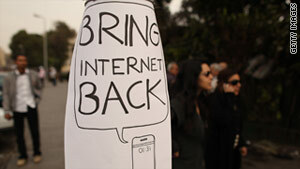 Protesters in Cairo, Egypt, call for the return of the Internet on February 1 after the government shut it down. U.S. Secretary of State Hillary Clinton said restrictions on Internet activity that prohibit free expression are among the most worrisome trends concerning human rights. Yet as governments become more savvy in their attempts to repress freedom of expression on the Internet, their citizens have become cyber-sleuths, creating innovative technologies to circumvent censors and authorities tracking their Internet activities. Tor is a circumvention tool that allows users to access censored information online, by bouncing communications among a network of users around the world, ultimately enabling its users to maintain anonymity online. Slim Amamou, a "hacktivist" based in Tunisia, describes Tor as a program that enables you to "circumvent the central service of censorship by using a computer from someone else in the world." It played a crucial role, he says, because social media pages sharing information about the protests were "systematically censored so you could not access them without censorship circumvention tools. "So [Tor] was vital to get information and share it." Speak to Tweet is a joint project between Google and Twitter that was first used during the Egyptian revolution when the Mubarak regime shut down access to the Internet. The application allows individuals to call a phone number and leave a voice mail, which is automatically translated into a tweet with a hashtag from the country of origin. The program has also been used in Syria, Libya and Bahrain. You can listen to the messages on Twitter through @speak2tweet. HTTPS Everywhere encrypts communications between its users and major websites, including Google, Twitter and Facebook. The Firefox extension was created by the Tor Project and the Electronic Frontier Foundation. According to Movements.org, "Using HTTPS means that you are creating a more secure channel over an unsecure network, better protecting you from surveillance and eavesdropping. HTTPS encrypts the transmission, but NOT the content you are transmitting." Psiphon allows clients to bypass content filters. Unlike Tor, users do not have to download the program, but they need to be invited into the network by another Psiphon user, making the network hard for oppressive governments to infiltrate. The Freedom House Review of Censorship Circumvention Tools recommends this program for uploading and distributing materials when a high level of security and fast app speed are required. Additionally, the report says, although Psiphon provides privacy, it does not give its users "full anonymity, since the proxy server will log all client activity." CryptoSMS is a service that sends and receives encrypted text messages, which is particularly invaluable in places where mobile phones are more readily available than Internet access. It requires the SMS sender to create a password that is used to encrypt the message. The recipient must have the password to decrypt it. CryptoSMS will not hide your phone number; it will merely encrypt the message itself. The number one thing that keeps me up at night is freedom. Pishevar developed his OpenMesh project as part of his participation in Ted Turner's U.N. Foundation Global Entrepreneurs Council. Each council member is young, varied and unassuming. Elliott Bisnow's company, Summit Series, doesn't even have a website. They organize "Woodstock or Burning Man [type events] for business people," he explains, and they do it all on Twitter. These philanthropic entrepreneurs know how to use current, even relatively old technology -- by crowd sourcing ideas and messages -- to create ephemeral communities and movements that direct political change and revolutions. In floods of political turmoil, people like Pishevar are trying to create oases for freedom. "The number one thing that keeps me up at night is freedom," he says. CNN's Scott Bronstein and Leon Jobe contributed to this report.